Hi I'm Donna Lynne, I'm a "non-writing" singer in need of original blues material to record on my debut cd. Vick Allen began singing and playing piano from the age of 5 years old. He found his best audiences at the age of 5 years old to be his family and church members who were astonished at Vick's ability at such an early age. Vick grew up in Jackson, Mississippi, a city known as a breeding ground for some of the hottest Blues and Gospel talents in the history of music, both record artist young and old. At the age 15 years old, Vick Allen produced and recorded his first CD; the CD was recorded in Jackson, Mississippi and served its purpose of getting his music and his name circulating in the Jackson music community. After graduating from high school, Vick started singing professionally with the popular group "The Canton Spirituals. Vick later ventured out on his own sharing the stage with such artists as Bobby "Blue" Bland, The O'Jays, Buddy Miles, and Willie Clayton. 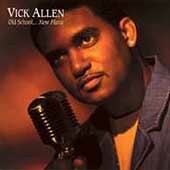 Vick Allen is a well-known singer, producer, performer, and musician in both the Gospel, R&B and Blues genres. Vick Allen has produced records for Grammy-nominated artists such as Blues legend Bobby Rush, and Gospel Greats, The Canton Spirituals, Vick has also produced records for other well known Blues artists: Peggy Scott-Adams, Toni Green, Willie Clayton and many others for Vicks production company Test-Mic Productions. Vick Allen has joined the Malaco Music Group signing his new contract with Waldoxy Records Vick's new CD release entitled "Old School...New Flava" single "I Better Walk Away" There's no doubt when you hear Vick Allen's CD then you will know he's the mellow, velvet voice of the 21st Century! Vick Allen "Old School...New Flava" Hold On, I'm Going Home, Clean house, Marry Me, Mr. Telephone Man, Giving Up,& So Sweet So Fine.